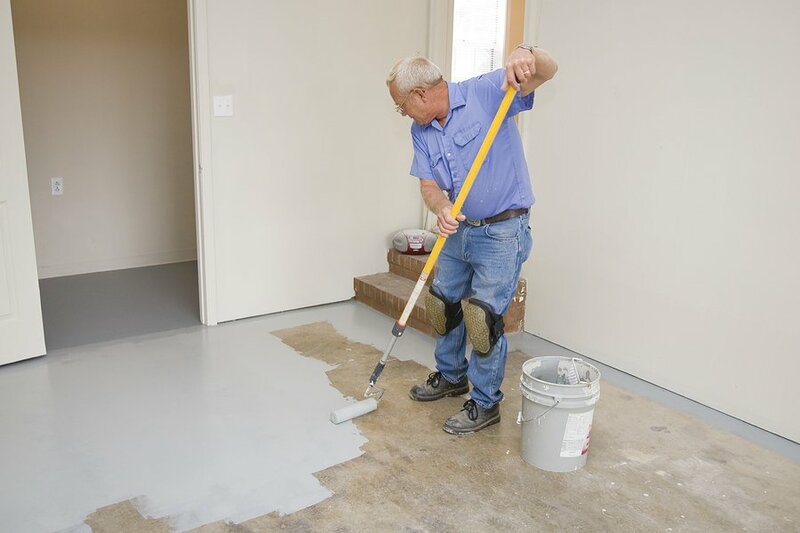 Don’t use just any paint for your concrete floors and walls. You need a specifically formulated paint that is designed to work on concrete. In addition, you are going to need to incorporate some additional skills and tactics. We’ve done all the research for you, simply follow our handy guide to find the best garage floor paint on the market. Then, you’ll be on your way successfully painting all your projects. You don’t want to use interior latex house when resurfacing a garage floor. This area is going to be the victim of abuse from gasoline, traffic, temperature, road salt, oil, and grime from your car. It needs a little extra attention and protection to keep it looking good for years to come. I know that spray paint seems like an easy solution, but spraying aerosol cans over large surfaces will not get you the results you desire. This applies to spray paints that even say they are suitable for outdoor use and masonry. When considering which paint to choose, you want the materials that will give you the longest lasting finish possible. Overall, there are five main choices that will work well. Latex is a common paint used on a variety of surfaces. Overall, the price can get a little costly and often this isn’t the best choice for your garage. While it is known to seal well, it will not provide the best seal. The biggest difference between latex and many other paints is that you can generally purchase one that is rated for outdoor usage. Latex also offers some of the fastest drying times compared to other materials. In addition, latex is easy to apply as long as your floor is cleaned and cured properly. 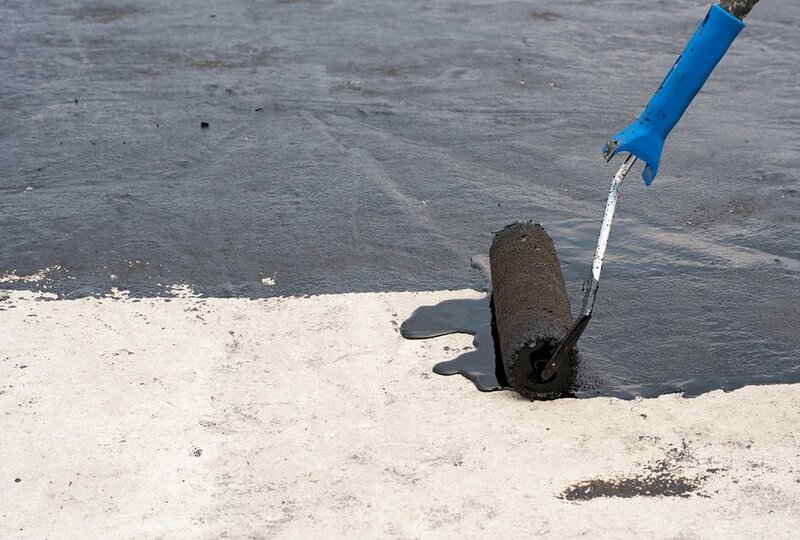 If your surface isn’t cleaned properly, you are going to face long-term durability issues with your project. Combine that with the fact that latex paint is already less durable and you set yourself up for a job that won’t last. Acrylic is a lot like latex in that it can be applied on top of your primed garage floor or as a 2-in-1 setup. Surprisingly, acrylic is less reliable when compared to latex. If your garage receives a large amount of foot traffic, it should not be used. In addition, if you park a car with hot tires on an acrylic painted floor, you can expect the paint to begin peeling. On the bright side, acrylic is one of the cheapest materials you can use to paint with. Generally, epoxy will be combined with latex or acrylic materials, but can also be used as a stand-alone product. Epoxy is technically known as a glue, not a paint. However, it has a lot of the same functions as paint. Epoxy is an amazing sealant, far better than latex or acrylic. It is also cheaper than many other products you can choose. A high-end epoxy is durable and will resist flaking, cracking or melting, even under hot wheels. There are some downsides to epoxies. The materials seem to take forever to dry. You are going to need a minimum of a day before you can even walk on it. Much longer time will be needed before you park in the garage again. Urethane will act much like epoxy, but with some additional features. It is more flexible than epoxy so it absorbs impact better. In addition, it is stain-resistant and offers great protection against chemicals, even paint thinners. You will not experience the yellowing that happens with epoxy when it is exposed to sunlight. That’s because urethane can handle most any temperature or humidity. The downside is that urethane does not bond to concrete as effectively as some materials. This can cause flaking in the future. You also cannot use urethane as a leveling paint. That’s why many people choose to put epoxy on their garage floor first and then complete the work with urethane paints. A great material for garage floor paint is polyureas. This subset of polyurethanes dries in as little as 5 seconds and can be completely hard within 5 minutes. This can make it difficult for anyone other than a professional to do the installation. It is durable and bonds to exposed concrete with superiority. This can even be used for mild leveling. Mechanics will want to stay clear of polyureas as they do not handle battery acids well. The better choice for that garage would be a urethane or epoxy. In addition, polyureas are the most expensive garage paint you can find. There are several factors that are going to play a part in choosing the best concrete paint. This is generally the most important concern to homeowners. You want to know that the job you perform today is going to hold up under the daily stresses and abuse of your garage. Each person is going to face different degrees of the wear and tear on their garage, so this is a personal decision based on your own needs. There are four main considerations when looking at durability issues. This refers to the temperature of your wheels on the vehicle you park in the garage. As you drive, the tires will heat up. Then, you park that car on the garage floor. ver time, that heat will weaken the paint’s bond and could even stick to your tire instead. This becomes more of a concern for mechanics and other craftsmen. It would be important to research the paint you desire to use the chemicals often found in your garage. You’ll need a paint that will stand up to interaction from those chemicals if spilled onto the floor. The more flexible a garage floor material is, the more it can withstand the impact and abrasions. This is going to refer to how well the paint responds to extreme temperatures. You’ll also need to consider wetness and humidity for your area. If you use low-quality floor paint, it will crack as the temperatures swing from extremes. In addition, the paint can lose adhesion once exposed to the elements. Another primary concern should be how well the best floor paint adheres to the garage floor. If it isn’t going to adhere properly, it really won’t matter how durable it is. In fact, some of the most durable paints can also be the ones that struggle to bond with the concrete. This could be alleviated if you use a professional to prepare your floor before painting. Finally, you need to determine the work it will take to prepare and apply the garage floor paint. Some applications are far easier than others. Take the time to evaluate the needs of each product you are considering. Then, make a decision based on your experience level and the amount of time you have to invest. When making the choice for the best paint for concrete, you’ll need to give some thought to the brand you want to use. There are several on the market that only produce high-quality products. This brand was designed as a way for a sea captain to keep his ship intact. What started as some drops of fish oil has become a huge business. Since then, the passion has been on creating rust-preventative paints that fit with the modern world. Rust-Oleum is a brand of problem-solving. They use cutting-edge, innovative products that will fit into most industries. They offer a coating for most any problem available. You can trust your garage floor to the company that has been providing solutions since 1921. Valspar believes that the right color can transform and brighten up your space. No other company around offers the amount of color and selection that Valspar currently does. In fact, for over 200 years now, Valspar has been connecting people to the right color for their environment. That’s what makes them one of the most well-known paint brands in the entire world. Whatever needs you might be facing, Valspar has the painting solution. This brand started in 1954 by Mr. Caldwell in St. Louis, MO. In 1974 he introduced the KILZ brand at the National Paint Show. Since then, they’ve offered an amazing variety of products including paints, primers, wood care and concrete coatings. Even today, you’ll find that they are one of the most known brands available for your coating needs. They also offer inspiration for DIY projects that can be done at home. When looking for solutions for your household coating needs, you can trust the KILZ brand to be top of the line and well worth the expense. Now that you understand the differences between the paints and what should be a factor in your purchasing decision, let’s talk about how to find quality floor paint. Overall, Epoxy paints tend to be the most favorable choice when painting a garage floor. There are factors that could make this different depending on the circumstances, but overall the best. Epoxy paint allows for maximum durability and longevity. You can purchase them in one or two-part formulas. The resin and hardener come premixed rather than during application. They are available in water based and solvent based formulas. These are a favorite because they offer a one-step application. In addition, the curing times are low and there are fewer fumes. Some of these will even include a non-slip finish. The one part epoxy is thin and not considered to be as durable as a two-part epoxy. When applying, follow preparation just like with a latex paint. This is a more labor-intensive option. It will, however, create a hard and durable floor surface. The resin and hardener are combined prior to application. This means there will be a preparation of the floor which includes cleaning and making necessary repairs. You might also need to etch the surface with a grinder or shot blaster. These formulas are available in solvent-based and 100% solids based. This option is more expensive but also considered the best epoxy coating possible. Most often, this will be applied by a professional. After looking through all the options for the best paint for garage floors, we’ve narrowed down the top choices. This product offers industrial toughness for even the most demanding environments. That’s why it is our pick as the best concrete floor paint. The Rust-Oleum paint offers a high solids solvent based epoxy. For the ultimate in adhesion and durability, this is a great kit to get the job done. This brand will stand up to heavy foot and vehicle traffic. This can be used as the best paint for garage walls as well. There is a variety of sizes to choose from as well as four different colors. No matter which option you choose, you can feel confident knowing that the job will be done right with Rust-Oleum. No matter which option you choose, you can feel confident knowing that the job will be done right with Rust-Oleum. Here’s another high-quality option from Rust-Oleum. This garage floor kit will handle more than just your garage. Consider using it as the best paint for basement floors as well. It will resist chemicals, so a perfect option for mechanics and handymen. In addition, you won’t have to worry about hot tire pickup. This paint kit is made in the United States and recommended for indoor use only. It cleans up easily with soap and water. In addition, there is a low odor for maximum comfort and safety. This product is available in gray or tan gloss for a perfect look no matter what your style. You can expect to receive a showroom-quality appearance with this fantastic kit. This garage floor coating kit offers a stunning semi-gloss finish. With the advanced bonding technology, you are going to receive a superior look. Valspar also offers anti-peel protection and no hot tire pickup. This means that it has maximum durability. This is a two-component epoxy system. You will notice that it is stronger than many other brands. In addition to protecting against hot tire pickup, you’ll also receive protection against gasoline, wear-and-tear plus oil spills. You can choose from light gray and tan colors for a personalized finish. Some people have even used this as the best paint for basement walls. This premium paint is waterproof. In addition, it will seal porous concrete as well as masonry surfaces. Because of this, you can use it indoors or outdoors. KILZ paint will form a barrier to stop water infiltration. The alkali-resistant coating allows for a long-lasting a durable finish. The paint will dry to the touch in just one hour and can be recoated after 4 hours. You can apply it with a nap roller, brush or airless sprayer. This formulation is low-odor for your safety. You can also tint it for a personalized application. This easy and simple to use kit from United Gilsonite Lab is ideal as a concrete floor paint. It is specially formulated to protect and beautify both interior and exterior masonry floors. There are many uses for this from garage floors, patios, steps, stenciling and sidewalks. This product is made in the US and can stand up to heavy traffic areas. It is also durable against weather and frequent washings. This finish offers a non-slip, low sheen surface. It is also convenient with the no primer needed. This two part epoxy kit provides a showroom, high-gloss finish. In addition, you’ll enjoy exceptional durability. The superior adhesion eliminates hot tire pickup. You can even begin application immediately after mixing. One 120-fluid ounce container will cover a standard one car garage floor up to 250-square feet. Keep in mind that this formula will also stand up to spills, grease, and oil. This advanced formula is a winner when painting concrete floors and walls. The Rust Bullet improves the overall look of concrete. It also provides a shield of protection against oil, chemical spills, and grease. Achieve a strong defense against abrasives, impact and atmospheric elements. This is a great option for garage floors, paths, walkways and more. You can cover about 300 to 400-square feet per gallon depending on the method you use and the porosity of the surface. Normally, two coats are the recommended usage. This isn’t just a great option as the best garage floor paint but is a fantastic choice for many other surfaces as well. No matter which option you determine to be the best garage floor paint, it is good to know that there are options available. By taking the time to refresh the look in your garage, you also set yourself up for improved protection against the elements.